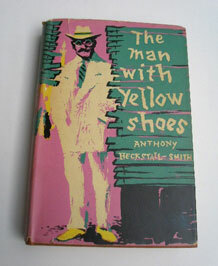 A great thriller by Anthony Heckstall- Smith and published by Allan Wingate and what a great title and dust cover! The Man with yellow shoes. This is a first edition 1957 costing 12/6. The dust jacket covers brown boards with black lettering. A great retro read and fabulous cover. CONDITION:Very good. Pages slightly yellowed at the edges. Dust cover has a tear to front top but nothing missing and spine is sligthly darkened. Pretty good condition considering its age.